LITTLE ROCK, Arkansas, April 28, 2014 (ENS) – At least 11 people have died in Arkansas and Oklahoma after tornadoes and thunderstorms blasted and twisted their way across the area Sunday night. 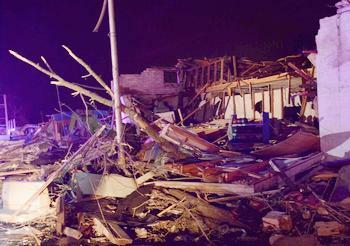 The town of Baxter Springs, Kansas also was damaged by the twisters. A tornado killed two people in the small northeastern Oklahoma town of Quapaw, emergency officials said. Police and fire vehicles poured into Vilonia, Arkansas after tornadoes slammed the town Sunday night. Emergency authorities reported a “mass casualty situation” in Vilonia with at least a dozen ambulances transporting the injured to hospital. Governor Beebe’s office is coordinating disaster response and cleanup efforts with the Arkansas State Police, the Arkansas National Guard and the state Forestry Commission. The governor spent the evening at the Emergency Operations Center at the Department of Emergency Management’s Camp Robinson headquarters receiving updates from Vilonia and Mayflower. Mayflower, a town of about 2,300, is about 22 miles northwest of Little Rock. Mayflower suffered a serious oil spill on March 29, 2013, when an ExxonMobil pipeline carrying heavy crude from Canada’s oil sands ruptured. Twenty-two homes were evacuated after pools of oil formed in a residential neighborhood. The National Weather Service reported that the Arkansas Game and Fish Commission headquarters east of Mayflower was damaged in Sunday’s tornadoes, and houses south of Mayflower were destroyed. The Arkansas Highway and Transportation Department said Interstate 40 in Faulkner County was closed from the 134 to 138 mile markers at Mayflower because of storm damage. The road was reopened by 9:20 pm. Roughly 30,000 Arkansans lost power at some point on Sunday night. Crews were working to restore power until nightfall and at least 10,000 people had their power restored. Dangerous severe thunderstorms and potentially tornadoes will continue overnight and into Monday for the Mississippi Valley, said the National Weather Service. The Storm Prediction Center forecasts a moderate risk of severe weather east of the Mississippi Valley Monday. WASHINGTON, DC, April 28, 2014 (ENS) – Sunday in Kuala Lumpur, Malaysia, President Barack Obama attended a signing ceremony to congratulate three American companies on the completion of commercial agreements in Malaysia worth more than $1.8 billion. One of the agreements will develop a new manufacturing facility to convert palm oil waste into valuable industrial chemicals. Under the agreement the Malaysian multi-sector company Sime Darby Berhad and the U.S. industrial biotechnology company Verdezyne, will cooperate to develop a new facility that will convert palm oil waste into industrial chemicals. Sime Darby is a publicly traded Malaysia-based multinational conglomerate involved in five core sectors: plantations, property, industrial, motors and energy and utilities. Based in San Diego, California, Verdezyne produces chemicals from renewable non-food sources using proprietary metabolic pathway engineering tools to develop unique yeast strains for production of the bio-based chemicals. In addition to clearing primal rainforests for oil palm plantations, displacing indigenous communities and endangered orangutans, the palm oil industry generates large quantity of wastes. Disposal of these wastes is a challenging task, according to BioEnergy Consult, an advisory and consulting organization based in India, that specializes in biomass energy, waste-to-energy and waste management. In the palm oil mill, the oil fruits are removed from the branches to be pressed for their oil, leaving the empty fruit bunches as residues. In a typical palm oil plantation, almost 70 percent of the fresh fruit bunches become wastes in the form of empty fruit bunches, fibers and shells, and liquid effluent. Verdezyne’s proprietary yeast fermentation technology can produce bio-based chemicals used in nylons and plastics from such waste. Sime Darby will take a 30 percent stake in Verdezyne, valued at $30 million. Verdezyne will use this investment to fund research and development in the United States. General Electric will supply engines and related maintenance to power 25 new A330 aircraft for Air Asia X. This sale, worth more than $1.5 billion, will support thousands of U.S. jobs. In the third agreement, MetLife and AmBank have agreed to cooperate on a $250 million venture to distribute savings and insurance products, including Takaful, Islamic-compliant insurance contracts. Malaysia is the second largest U.S. trading partner in ASEAN and the United States is Malaysia’s fourth largest trading partner worldwide. CHICAGO, Illinois, April 28, 2014 (ENS) – The governors of the eight Great Lakes states and the premiers of Ontario and Québec Saturday signed a deal that will empower them to collaborate, sharing staff and expertise to keep Asian carp from reaching the Great Lakes and its lucrative fishing industry. Calling the Mutual Aid Agreement “the first of its kind in the world” the Council of Great Lakes Governors meeting at Chicago’s Shedd Aquarium said it would prevent the introduction and spread of aquatic invasive species. Yet no deal was concluded on how to pay for actions taken under the agreement. Asian bighead and silver carp species were originally imported into the United States in the 1970s to improve water quality in sewage treatment plants and aquaculture facilities by eating excess or undesirable plankton. But some escaped from southern fish farms and reproduced rapidly. Now these large, jumping fish that can grow to more than 90 pounds have populated most of the Mississippi River basin, moving farther north every year. Despite the millions spent by the federal government to control them, Asian carp are moving toward the Great Lakes through rivers and canals and menacing the aquatic food chain as they go because they consume the plankton needed by native species. One approach to control would physically separate the Great Lakes from the Mississippi watersheds by placing structures in Chicago-area canals they would block their access to Lake Michigan. But there is opposition to that plan in Illinois and Indiana. Still the Mutual Aid Agreement holds out the hope of resolving the conflict by working together. “The threat of aquatic invasive species transcends borders, and this agreement allows us to address this threat through collaboration and cooperation,” said Michigan Governor Rick Snyder, the Council’s other co-chairman. Governors Quinn and Snyder were joined by representatives of Québec Premier Philippe Couillard and Ontario Premier Kathleen Wynne; Wisconsin Governor Scott Walker; and Senior representatives of Indiana Governor Mike Pence, Minnesota Governor Mark Dayton, New York Governor Andrew Cuomo, Ohio Governor John Kasich and Pennsylvania Governor Tom Corbett. Among state and provincial initiatives announced at the meeting, New York has banned the importation, possession and sale of live bighead carp in the state. Ontario has just introduced the Invasive Species Act to support the prevention, early detection, rapid response and eradication of invasive species in the province. The five Great Lakes and the St. Lawrence River comprise the world’s largest surface freshwater system. The Great Lakes contain one-fifth of the world’s fresh water. Aquatic invasive species are among the greatest ecological threats to them. LOS ANGELES, California, April 28, 2014 (ENS) – A German company has been sentenced to pay a $1 million fine and another $250,000 to support environmental causes after pleading guilty to two felony environmental charges related to a cargo ship that entered the Port of Long Beach last year with an open crack in its hull. The crack may have caused oil to leak into the port. The company, Herm. Dauelsberg GmbH & Co. KG, pleaded guilty Thursday to a felony count of failing to maintain accurate records relating to the overboard disposal of fuel oil and to a felony count of failing to report to the U.S. Coast Guard a hazardous condition aboard the M/V Bellavia. This case was initiated after four members of the M/V Bellavia crew provided information to the U.S. Coast Guard, including pictures and videos of discharges from a fuel tank into the ocean. Using a federal law that allows a federal judge to award up to half of any criminal fine to “whistleblowers” who provide information concerning certain environmental crimes aboard vessels, Judge George Wu ordered that the four crewmembers receive a total of $500,000 from the fine amount. The M/V Bellavia is a 960-foot-long, Panamax-size ship that transports cargo between European, Central American and North American ports. In 2011, the M/V Bellavia sustained cracks in the ship’s hull while moving through the Panama Canal. On an unknown number of occasions over the past three years, the hull cracks opened to such an extent that seawater could enter one of the ship’s fuel tanks. As a result of the damage, heavy, thick bunker fuel oil could have been released from the fuel tank into the sea. Herm. Dauelsberg admitted that the M/V Bellavia hit the side of the Panama Canal again in September 2013, sustaining a crack that passed through the ship’s hull into a fuel tank. The company also admitted that, after sustaining the crack, the ship’s crew used one of the ship’s pumps to discharge nearly 120,000 gallons of oil-contaminated seawater from the ship’s fuel tank directly into the ocean. That discharge was not done using the ship’s oil-water separator, which is supposed to filter oil out of water that is pumped overboard. The ship’s crew then failed to properly record the discharge in the ship’s records and did not disclose it to the Coast Guard, as required by federal law, when the ship arrived in the Port of Long Beach in October 2013. In addition, the company admitted that it failed to notify the Coast Guard that the crack that passed through the ship’s hull into the fuel tank, a hazardous condition. After accepting the guilty pleas, Judge Wu sentenced the company to the statutory maximum fine of $1 million. He ordered the company to make an additional community service payment of $250,000 to the Channel Islands Natural Resources Protection Fund, which is administered by the National Park Foundation. The community service payment will fund environmental projects, enforcement efforts, and initiatives for the enforcement of environmental and public safety regulations. WASHINGTON, DC, April 28, 2014 (ENS) – An innovative air conditioning system that runs on solar power, a low-cost monitor for measuring water quality, and a new kind of fabric made with fibers from bacteria and yeast grown in tea – these are a few of the sevem winning proposals from student teams competing for grants from the U.S. Environmental Protection Agency. The EPA announced seven winning student teams of EPA’s People, Prosperity and the Planet phase II awards on Sunday, at the 10th annual National Sustainable Design Expo in Washington, hosted by the world’s largest science festival, the USA Science and Engineering Festival. Cornell University, New York, for designing a low-cost monitor for measuring water quality. Embry-Riddle Aeronautical University, Florida, for designing an innovative air conditioning system that runs on solar power. Iowa State University for designing a new kind of fabric made with fibers from bacteria and yeast grown in tea and polymers of corn and soy. Purdue University, Indiana, for researching how to improve indoor air quality by using plants grown in the air filter of a home HVAC system. SUNY Stony Brook, New York, for designing and building Poseidon, an ocean energy harvester that converts wave motion into electrical energy. University of Tennessee, Knoxville, for exploring ways to use green oak or “heart centers,” the low-quality part of hardwood logs in U.S. building construction. University of Wisconsin, Madison, for implementing a campus recycling program for expanded polystyrene packaging thereby diverting almost 2000 boxes and other polystyrene material from landfills in 6 months of operation. “As we mark the 10th year of the National Sustainable Design Expo and P3 competition, we continue to be inspired by the next generation of scientists and engineers shaping the future of our country,” said Bob Perciasepe, U.S. EPA deputy administrator. “These students support a vision for the future that encourages a prosperous economy while seeking sustainable and creative solutions to some of the most pressing environmental and health challenges facing our world,” he said. EPA’s P3 Program challenges student teams to create designs for a sustainable future. The winners were selected from 35 competing teams following two days of judging by a panel of national experts convened by the American Association for the Advancement of Science. The winning teams announced Sunday each received EPA’s P3 award and will each be recommended for Phase II funding of a grant up to $90,000. Phase I funding provided each team with up to $15,000 to develop their design. In addition to the seven winning teams, 17 teams were recongized as Honorable Mentions for their projects. Now in its tenth year, EPA’s P3 program has funded 477 student team projects, involving over 3,400 undergraduate and graduate students and 1,000 faculty members.